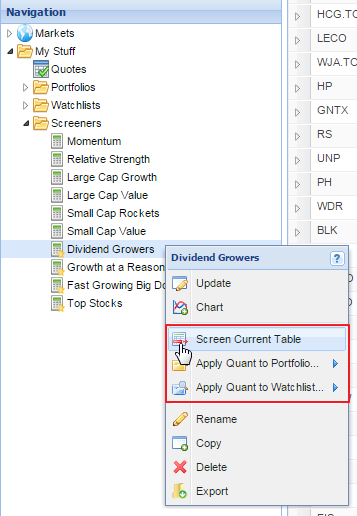 While running a screener applies the screener criteria to all of the stocks in the North American exchanges, it is possible to apply the filters from a screener to any defined population of stocks, such as a portfolio, watchlist, or sector (unless the screener contains an equation, in which case it is not able to be applied to the Table and this option will be greyed out.). To do this, first load the set of tickers you want to screen in the Table. Then, right-click on the screener you want to apply to those tickers in the Navigation panel and select ‘Screen Current Table.’ The screener criteria will now be applied as a set of filters to the Table. For more on how filters work, see the Filter section of the help documentation. If the screener you want to apply is a ranked screener, you will have the option to either apply just the non-ranked screener criteria to the Table (that will apply filter values but no weights) by selecting ‘Screen Current Table,’ or you have the option to rank the portfolio or watchlist by the screener criteria by selecting ‘Apply Ranked Screener to Portfolio’ or ‘Apply Ranked Screener to Watchlist,’ again, unless the screener contains an equation, in which case it is not able to be applied to the Table and these option will be greyed out. This will load that portfolio or watchlist in the Table, as well as add two additional ‘Rank’ columns to the Table. The first rank column shows the rank number of any the stocks in the portfolio that pass the ranked screener out of all the stocks in the North American exchanges. The second rank column will rank just the stocks in the portfolio or watchlist according to the specified weights. 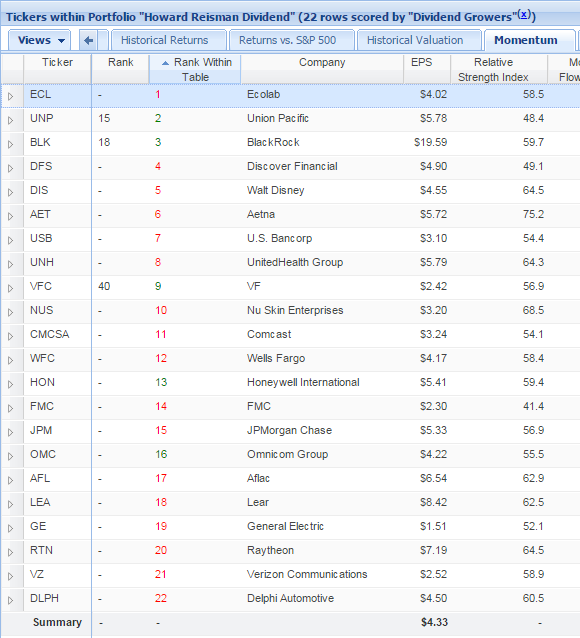 The ‘Rank Within Table’ number will be green if the stock passed the original ranked screener and red if it did not. If you mouseover the rank, you can see the breakdown of the scoring. 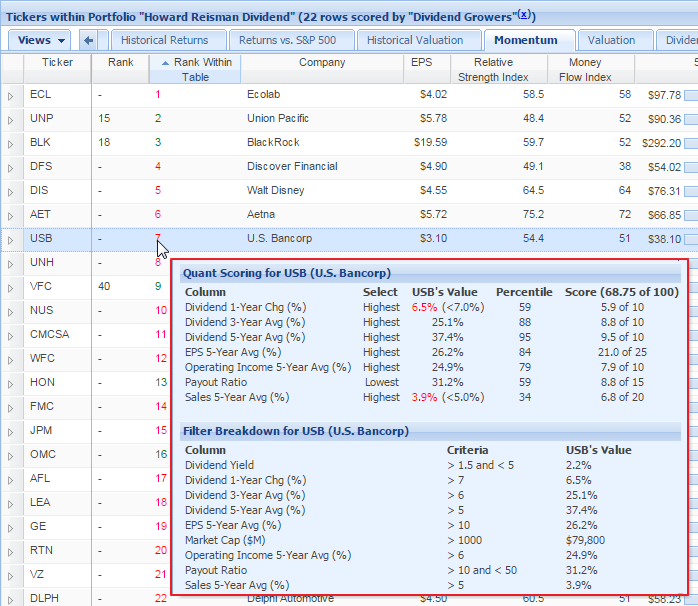 Values in red indicate where the stock failed to pass the original ranked screener. You can still get scoring information about a stock even if it didn’t pass the original screener, simply mouseover the dash in the ‘Rank’ column and you will see scoring and the filter breakdown for that stock. Failing criteria are in red.